The TORO Test: Methacrylates In Action! On January 25, 2010, Winnipeg was hit with a blast of Arctic air, along with a LOT of snow, most which seemed to settle on or around our office. NO PROBLEM! 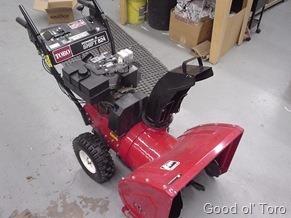 We have our handy Toro snow blower to help dig us out! This machine’s been with the company so long, it has more seniority than 60% of our staff, so it’s not entirely surprising to find some of the parts on this machine are wearing out. While in the process of cleaning our tiny parking lot, I noticed the chute (where the snow is ejected from the machine) was wobbling around, and about to fall off. Upon further inspection, I discovered that the chute is attached to a sort of welded flange. This flange is welded to the main body of the snow blower, and after years of use a section of the flange had broken off. My first reaction was “We need a welder, stat!” but since I don’t have a welder (yet), and it would take too long to take it to someone with a welder, I had to find another way. Peter, our Salesman and resident adhesives expert suggested we glue it back together. So that’s what we did! After all, we stand behind our adhesives, right? So we took a few minutes to discuss the details of our application: Will this MP55310 bond metal to metal? Turns out it’s not necessarily bonding “metal” to “metal”, since these are painted parts. We did NOT remove the paint, so technically this is a ‘paint to paint’ bond. Stay tuned for an upcoming article on “What Are You REALLY Bonding” for some good information on adhesives. We removed the chute from the snow blower to allow easy access to the flange. 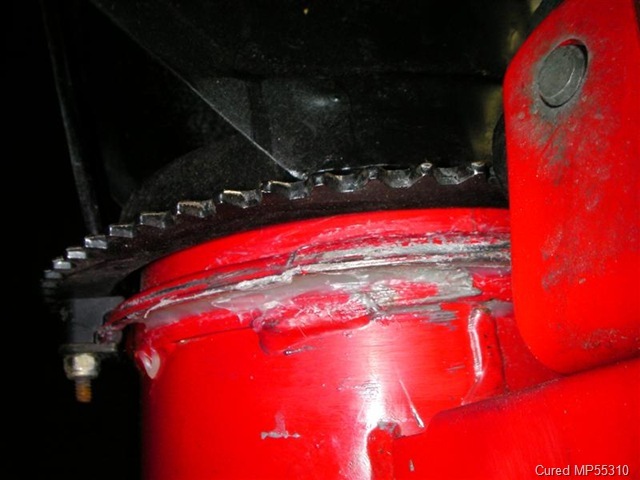 We used a wire brush to clean around the flange and particularly the damaged area from any loose debris or dirt. We then positioned the flange section and began applying the adhesive all around the chute opening, making sure to fill the break completely. Once the glue was applied, I used a putty knife to smooth out the adhesive on the underside of the flange (and to remove any excess). After 30 minutes, the adhesive was already beginning to cure. The very next day, I re-assembled the machine, fired it up, and moved a mountain of snow in –30C temperature. The glue had been curing for just over 18 hours, and it held fast. Want to know how our repair is holding up? Want to try this on your own? Use our Contact Form and ask for an update or for some product information. UPDATE! – March 19, 2011: The snow is almost gone now but we’ve had two major snowfalls since this article was posted. I’m proud to say that the repair is holding up beautifully! No signs of loosening of the bonded parts, no flexing, bending, chipping or peeling. It’s a sight to behold. In fact, today we had some visitors come to the office to see for themselves! Yup, they heard that we’d repaired our snowblower’s discharge chute with glue, and they just had to see it with their own eyes. They were amazed! If you’ve ever used silicones, you know how overwhelming the smell can be. You may also know that too much of an overwhelming thing requires intervention from your Workplace Health and Safety Committee! The answer need not be “more ventilation” or “use only outdoors”! Adhesive Systems offers a range of Methacrylate adhesives designed to bond a HUGE variety of materials. But don’t take our word for it- we’ll PROVE it with a demonstration in your facility AND…they’re available in any container or tube size you might need. Call today for your FREE demonstration! The MP 55000 SERIES is a complete family of two part methacrylate adhesives. These products are specifically engineered for structural bonding of nearly all thermoplastics, metals, and composite materials. They offer exceptional bond strength and are extremely durable adhesives. The MP 55000 SERIES provides outstanding performance in a wide range of applications in the transportation, solid surface, industrial, construction, and marine market areas.